Kitty Cerviani and Jean Crawford scored 0.35 masterpoints with a 50.57% game at Bridge On Shea. See full results of this game. Cindy O'Connell and Matthew Mandel scored 0.89 masterpoints with a 54.4% game at In Tempo Bridge Club. See full results of this game. Kathye Brown and Ellen O'Hara scored 0.62 masterpoints with a 54.53% game at In Tempo Bridge Club. See full results of this game. Rodney Houston and Sandra Paley scored 0.15 masterpoints with a 52.4% game at In Tempo Bridge Club. See full results of this game. Janis Merrill and Ellen O'Hara scored 2.17 masterpoints with a ★63.7%★ game at In Tempo Bridge Club. See full results of this game. Patrica Bogacz and Cindy OConnell scored 0.29 masterpoints with a 51.79% game at Bridge On Shea. See full results of this game. Ellen O'Hara and Kathye Brown scored 0.20 masterpoints with a 51.92% game at In Tempo Bridge Club. See full results of this game. Rodney Houston and Sandra Paley scored 0.16 masterpoints with a 50.66% game at In Tempo Bridge Club. See full results of this game. Kitty Cerviani and Jean Crawford scored 0.45 masterpoints with a 49.31% game at Bridge On Shea. See full results of this game. Sheila Shapiro and Diane Wright scored 0.20 masterpoints with a 50.6% game at In Tempo Bridge Club. See full results of this game. Janis Merrill and Ellen O'Hara scored 1.19 masterpoints with a 56.58% game at In Tempo Bridge Club. See full results of this game. Janis Merrill and Ellen O'Hara scored 0.44 masterpoints with a 52.52% game at In Tempo Bridge Club. See full results of this game. 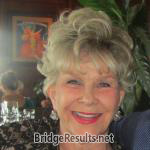 Lois Hollander and Doris Minsker scored 0.20 masterpoints with a 46.97% game at In Tempo Bridge Club. See full results of this game. Patti Weigler and Jill Polacheck scored 1.11 masterpoints with a 56.21% game at Bridge On Shea. See full results of this game.